” The Referendum on 15 June 2019 is not just a political referendum. It is a Referendum on what kind of society Bougainville wants to have. It is a referendum on our resources and economic choices into future. It is a referendum on how we relate and contribute to the world’s wellbeing being part of the global community. It is a referendum on how much and for how long we want the island to prosper and what our generation will bequeath to our children and their children and their children’s children. We definitely do not want a Bougainville where a few benefit at the expense of the majority. No child in Bougainville should suffer or sacrifice their future owing to poor decisions around development and management of our natural resources and our environment. You might have seen a recent TV report showing a huge area of rainforest in Pomio, East New Britain, that has been completely logged and bulldozed and is expected to be turned into an oil palm plantation. It is like walking through a thick and dense tropical jungle, after some hours you walk into an empty space, into an open field denuded and devoid of trees. You look straight ahead and you see nothing standing but a barren field with odour and sight of death and destruction. It is very confronting. You do not know what to think or what to say. You find it very hard to breathe because a solid lump of something has come up your oesophagus and is embedded in your throat. This is what losing whole tracts of native forests in traditional land can do to you. Logging by foreign companies is the worst example of intrusion into traditional landowners natural habitats. These are complex habitats, including many sacred sites, that have supported lives, cultures, and that give meaning to the relationship between man and his environment. It is an existential relationship beyond any symbiotic explanation that defines why and how the world’s people find themselves settled where they are on this planet. Papua New Guinea, insofar as the world’s rainforests are concerned, is a part of the planet that is still blessed and still full of life compared to others countries that have squandered their forests and dislocated their forest people. Companies that arrive here with men, machines and plants from these countries do so with foreboding contempt of the planet as if it is lifeless with no feelings. It is a total disregard for the people’s lifelong dependence and fascination with the places they have call home – their seas and oceans, the old growth tropical rainforests, the creatures that add life and colour to the beautiful landscape where there is sharing and caring for one another. The planet is not lifeless to not be concerned about snuffing life out of it. And yet this is exactly the behavior of loggers that come here after depleting forests in their own countries. Somehow they have succeeded to numb us, hypnotize and buy us off with the colour, smell and value of money which will never ever be enough to account for or replace what they take away and the destruction they leave behind. The recent report on TV also let it be known that Papua New Guinea has overtaken Malaysia to become the world’s biggest exporter of tropical hardwood. The desolate moonscape you see on the screen used to be a living, breathing forest, providing habitat for animals and birds, filtering drinking water for villages and providing an ever-renewing source of house-building materials. Now the trees, animals, birds and clean water are gone. The wood has been shipped to China to be processed and sold in other parts of the world. So much damage has been done to the next generation’s inheritance through the notorious Special Agricultural and Business Leases (SABLs). SABLs have been big money-spinners for multinational logging companies, allowing the companies to clear fell vast tracts of people’s forest and use the profits from timber to finance establishment of oil palm plantations. The plantations might look green, but they are nothing like the richly biodiverse rainforest. Rather, they are barren monocultures with a limited lifespan. Why do we continue to let this happen to irreplaceable tropical rainforests? And why is it up to NGOs to tell us what’s happening! Why aren’t the people we elect to represent our interests actually representing our interests? Sadly, the lessons of the past are going unlearned. The Fly River is not the same since BHP left it for dead. The only worse river disaster in our region is the Aikwa River in Indonesia’s Papua province, which has turned thick and grey from decades of tailings from the Freeport gold and copper mine being dumped into the waterway. Mining there, which is carried out under armed military guard, looks set to continue until the entire resource is gone. The Jaba River in Bougainville isn’t too far behind. While there is evidence the river and its tributaries are regenerating, the banks and marshes will never be the same as they once were. 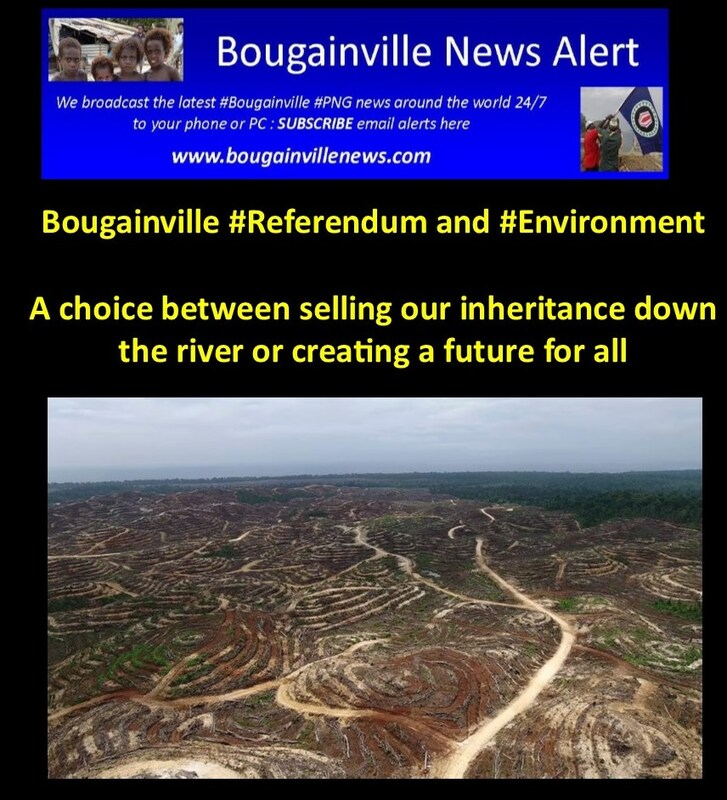 Those opposing any return to mining in Panguna raise concerns about the natural environment and the legacy that will be left for future generations of Bougainvilleans. It won’t be long before Ramu Nickel’s effluence clogs the rivers and estuaries where everything is being dumped including the sea. Don’t hold your breath that environmental laws will protect the environment on which the bulk of the population depends for their entire livelihoods. They cannot eat effluent. PNG is a guinea pig, the world’s first, in underwater/seabed mining by Nautilus off the waters off of New Ireland, East and West New Britain and Manus Provinces. The world should be absolutely appalled that a company that has borrowed and uses the name of a beautiful sea living creature is sending down gigantic machines, controlled from the water’s surface, to plough the sea floor, mechanically scavenging sea vents and destroying everything in their way, including the habitat of the nautilus shell. This is why Nautilus, a Canadian company, will not mine the seabed off Canada. If it is not allowed or is illegal to mine underwater in Canada. So, where does the company pluck the courage or get the audacity to ravage and plunder in our waters. The company has done its sums, while in a too familiar story in this country, the local populations are left scratching their heads, wondering just how their contented and happy lives are going to be made happier by this ravaging of their local environment. Nautilus company executives and its PNG citizen staff that are promoting and supporting this guinea pig project should be looked in the eye and asked just why this destructive project should proceed. Greed and insatiable appetite for profit at whatever cost to the local environment are the apparent underlying reasons. Enough is never enough. The company and its promoters seem to be wilfully blind not to want to see how much the people depend on the environment for their lives. Nothing can ever take the place of what the indigenous people have always regarded and used as their capital that has supported and sustained generations since time immemorial. The Autonomous Region of Bougainville is in a great position to learn valuable lessons from the Panguna mine and from the violent crisis that followed. A story Bougainville is still reeling from. Bougainville must also learn from the experiences in other parts of the country and the region where resources wealth when exploited does not equal economic or social improvement for the resource owners. Bougainville is a small island, fragile and prone to all manners of exploitation, given its natural resources. Resource development in partnership with investors is not evil. But there must be zero tolerance when it comes to companies not complying fully with environmental laws of protection and conservation. There must not be a repeat to the worst case scenarios of what led to the Bougainville scenarios. The leaders must maintain a level of vigilance and commitment that behooves all of us to be at our best standards and practices of good governance. We may be already lagging in enacting relevant environmental and conservation legislation. It is simply wrong to say it is impossible to attract investment if we are strong on our statutory requirements and benchmarks for investment. It is in the interests of Bougainville and prospective investors to do sustainable business. This is not possible if the land and resources are destroyed in a one-off feeding frenzy. Careful stewardship is what sustains any business investment. Most of all, Bougainville must beware – and be aware – and learn from its mistakes and the mistakes of others. Smart business will always pay. Mindful business will always pay. The people who need protection are the resource owners. Long before Panguna the landowners there were self-sufficient, independent of the judgment of others and wise with how they treated and used the land, the rivers, the trees and the forests. We need the efforts and assistance of others to ‘develop’ Bougainville in a way that will last. We need investors that will build mutual trust with our leaders and resource owners. We need to educate and inform resource owners to respect laws and agreements with genuine investors. It must be a two-way street. The Referendum on 15 June 2019 is not just a political referendum. It is a Referendum on what kind of society Bougainville wants to have. It is a referendum on our resources and economic choices into future. It is a referendum on how we relate and contribute to the world’s wellbeing being part of the global community. It is a referendum on how much and for how long we want the island to prosper and what our generation will bequeath to our children and their children and their children’s children. Any development at, around, and in forest rich resource areas in fragile environments like Tonolei must stand and pass the scrutiny of all stakeholders, the ABG, independent experts on land use and those that have studied the known damage to land by palm oil plantations. We must not shy away from independent critique on the potential decimation of the area, including logging and denuding trees if an SABL-type Agreement is what is being proposed. Transparency is the key to all resources development to which governments are a party. We must come out of the Referendum, irrespective of how the cookie crumbles, with a Bougainville that caters to everybody. A Bougainville that everyone benefits from because we all own a piece of her. A Bougainville where our inherent cultures are not so much about giving and taking but rather, more about sharing. We definitely do not want a Bougainville where a few benefit at the expense of the majority. No child in Bougainville should suffer or sacrifice their future owing to poor decisions around development and management of our natural resources and our environment. The choice is we either sell our inheritance down the river or create a future for all, always putting children and future generations first.